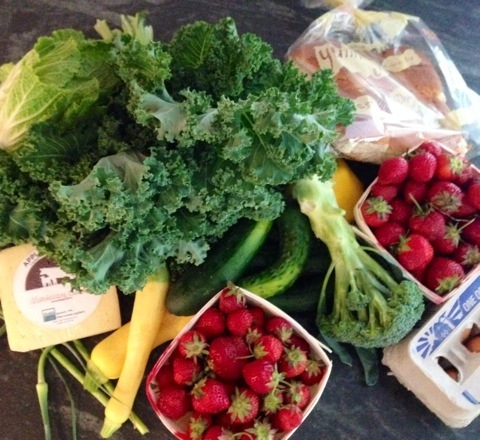 For the summer months, I am a member of my local CSA (Community Supported Agriculture) which means I get a weekly box of local, mostly-organic farm-fresh fruit, vegetables, eggs, bread and cheese. So, I pickup my share on Thursdays, make a plan on Friday, pickup any remaining items I need on Saturday at the Farmer’s Market or the grocery store, then start cooking! So, a Thursday CSA share usually lasts me through the following Friday/Saturday. The trickiest part of the whole thing is “making a plan” – it includes checking my pantry, searching for recipes, and making creative substitution so I can use all of the fresh ingredients. Making sauerkraut is cool too and an interesting experiment. Whoever thought to eat something that got all yucky/moldy originally was absolutely crazy. Thanks for sharing, Chandra! I will definitely check this out, as my go-to is usually cabbage soup, which my kiddos won’t touch!